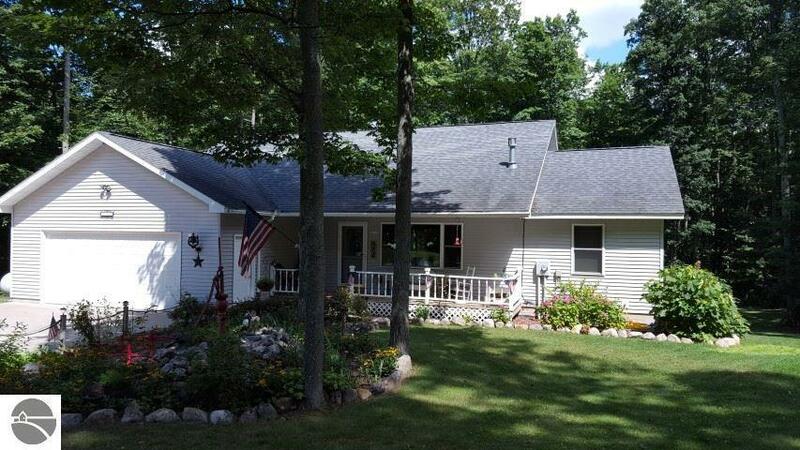 Wooded Country Living from this absolutely beautiful home and setting! This home offers 3 bedrooms, 3 baths and an office that could easily be converted to a 4th bedroom. Large living room with gas fireplace & vaulted ceilings, extra large kitchen with breakfast nook, wonderful master bedroom with bath and walk-in closets, that also leads to a deck (built & 220v wired for hot tub!) overlooking a lovely garden, open area and woods! Lower level boasts a large family room with wet bar, bedroom, bath, office and pellet stove. This 5 acre landscaped setting also offers a 14 x 20 pole building with a concrete floor (no elect) and a 10 x 12 garden shed for your boat storage and gardening needs! Click on the "Virtual Tour" link to watch an exterior, aerial drone video of this beautiful property! Chain of Lakes Fiber Optic High Speed Internet is installed to the street and service is available!! Din Rm Size: 10' x 10"
Liv Rm Size: 16' 4" x 20"